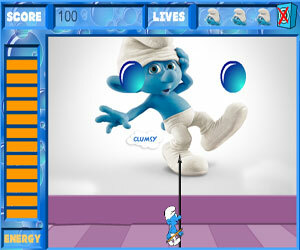 Description In this Arcade Game you are a Smurf who is being crushed by big round bubbles. You have to get out of the way of the falling bubbles and destroy them by using your harpoon. Each hit breaks the bubbles into two until they are small enough to destroy completely. Conserve your energy and collect power-ups to help you on your way. There are 5 levels to complete in this game.